Many people are familiar with Chia Pets, the clay pots where sprouted chia seeds grow “hair” on animals or figurines. Fewer of us are familiar with the chia seeds used in many foods, drinks, cereal, and baked goods. If you take a look in your grocery store, you may notice more packaged foods and drinks are now incorporating chia seeds, especially in health food stores. Chia is actually an herb in the mint family, which is grown for its highly nutritious tiny seeds. A staple to the ancient Aztec and Mayan diets, chia seeds are now making their comeback in the 21st century. Why are chia seeds so nutritious? These tiny seeds are packed full of nutrition. They are balanced with fat, protein, and carbohydrates (80% of which is in the healthy form of fiber), are rich in minerals such as calcium, iron, magnesium, and phosphorus, and even contain a good amount of antioxidants! My number one reason for recommending chia seeds is their high content of anti-inflammatory omega 3 fatty acids. Many foods we eat today have a high amount of omega 6 fatty acids (refined vegetable oils and grain fed animal products) and not enough omega 3 fatty acids, which are also found in fatty fish, flax seeds, seaweed, fermented soy, and grass fed animal products (butter, eggs, meats, dairy). A healthy balance of omega 6 to omega 3 fatty acids is important for overall health. Having too many omega 6 fatty acids and too little omega 3 fatty acids may contribute to excessive inflammation in the body, leading to all sorts of health problems including heart disease, diabetes, auto-immune diseases, and even cancer. Chia seeds contain three times more omega 3 fatty acids than omega 6 fatty acids (60% of the fat is omega 3 and 20% is omega 6), with each tablespoon containing approximately 2000 mg of omega 3 fatty acids, more than any other food! 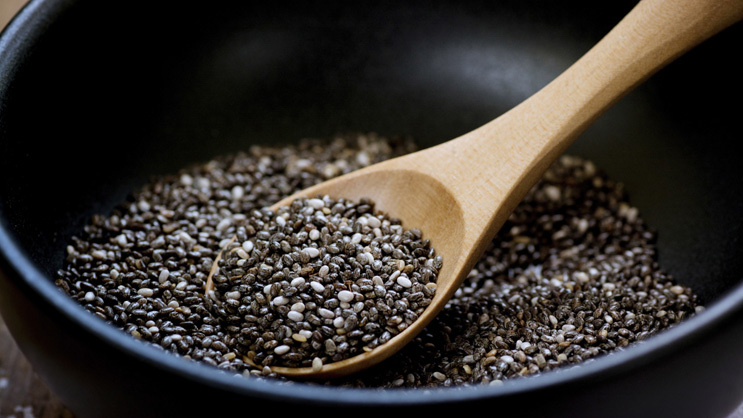 If you have any underlying inflammatory conditions (such as diabetes, pancreatitis, skin or neurological disorders to name a few), try balancing the omega 3 to omega 6 ratio in your diet by including chia seeds. How can I incorporate chia seeds into my diet? Due to their ability to hold water, chia seeds can be used as part of almost any food, even in baked goods! When chia seeds are left to soak, they absorb fluid, creating a gel-like substance around the seed. If you are an adventurous baker, try replacing eggs with chia seeds by mixing one part chia seeds to 6 parts water (must let sit until gel forms). About 1 tablespoon of this mixture is equivalent to 1 large egg in a recipe. My favorite way to eat chia seeds is added to oatmeal for breakfast. They are also great to add to a smoothie or granola, top off a salad for a crunch, or even use to make a pudding! Mix ¼ cup chia seeds with 1 cup liquid (coconut milk is especially tasty) and let it sit covered and refrigerated for several hours or overnight. Then mix in a spoonful of cocoa powder and honey, and enjoy! You may also want to add berries, nuts, or sliced banana for variation. To make vanilla chia pudding, just omit the cocoa and add 1 tsp vanilla extract instead. Do you eat chia seeds? Share your favorite recipes here! Nutrition counseling is a free service offered to all patients of The Pancreas Center. Learn more or request an appointment with Deborah Gerszberg at The Pancreas Center’s website.